Messing with your hormones won't help to reveal your abs, ladies! I have written about this problem previously. Actually the whole SuppVersity "Athlete's Triad"-Series (read it) is remotely related to it: Women working out like hulk and eating like a sparrow. A behavior that leads to hormonal imbalances and amenorrhea very reliably. So if you are wondering, why your menstrual cycle is messed up. Why you cannot get pregnant or why you simply stopped menstruating, ladies, this article is for you. Needless to say that the same goes for male and female trainers, obviously, for whom the results of a very recent study from the Pennsylvania State University and the Penn State University College of Medicine (Williams. 2014). 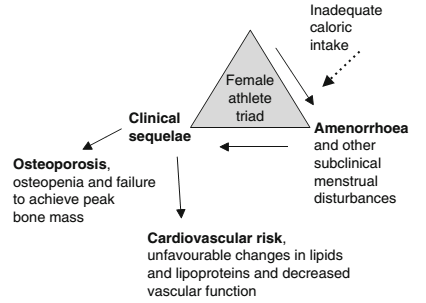 Low T3 syndrome is also a result of dieting and a part of the (Female) Athletes Triad. The study Nancy I. Williams and her colleagues conducted was designed to confirm or refute the that there would be a dose-response relationship between the induction of menstrual disturbances (luteal phase defects, anovulation, and oligomenorrhea) and the magnitude of energy deficiency. In other words, the researchers expected that higher energy deficits would incur a significantly greater incidence and more severe disturbances of their menstrual cycle disturbances. 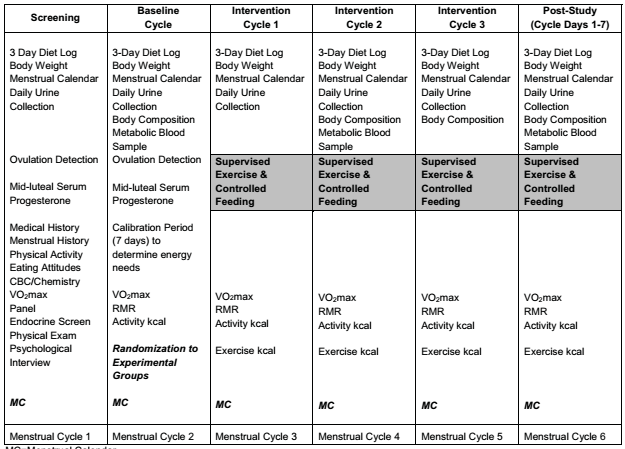 To evaluate their hypothesis, the researchers conducted a randomized prospective design that employed controlled feeding and supervised laboratory-based exercise over the course of three menstrual cycles in young, untrained, premenopausal, eumenorrheic women. "The study was conducted over three years, with yearly cohorts recruited in the fall of the academic year and followed until the end of spring semester. The controlled feeding and exercise training began after the Screening and Baseline periods, each period lasting one menstrual cycle. All phases of the intervention were anchored to subjects’ menstrual cycles, and each study phase consisted of one menstrual cycle (Intervention Cycle 1, Intervention Cycle 2, Intervention Cycle 3). A post study period of one week where diet and exercise remained controlled allowed for post intervention measurements. The study design is illustrated in Table 1. The study was conducted with healthy young, weights-stable women, who had not evidence or history of disordered eating were aged 18 – 30 years, weighed 45 – 75kg and had a normal body fat level of 15 – 35%. The women didn't smoke, were not hormones or anti-contraceptives. So what did the scientists do? During the Baseline period, subjects were randomly assigned to an experimental group for the Intervention Cycles 1, 2, and 3 of the study. 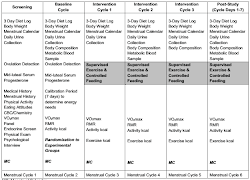 The goal of the subject groupings was to test the impact of varying levels of an energy deficit created by the combination of caloric restriction and exercise on menstrual function. The overlooked significance of hormonal imbalances: As Williams et al. point out, "[a] large body of evidence in a variety of mammalian species has demonstrated a causal link between chronic energy deficiency and the suppression of reproductive function involving the central inhibition of gonadotropin releasing hormone (GnRH) pulsatility" (Williams. 2014). In humans, long term energy deficiency can result in functional hypothalamic amenorrhea, (FHA) and therefore, decrease estrogen exposure, diminishing estrogen’s impact on bone, reproductive, and cardiovascular regulation, often resulting in bone loss (Rencken. 1996; Wade. 1996), stress fractures - specifically in athletes (Barrow. 1988; Bennel. 1999; Brukner. 1997), transient infertility, dyslipidemia, and impaired endothelial function (Friday. 1993, Hoch. 2007; O’Donnell. 2004). They were assigned to either a control group that did not exercise and consumed an amount of calories estimated to maintain body weight, a control group that exercised, but received extra food calories to remain in energy balance (exercising controls or EXCON), or one of four groups that exercised and were prescribed reduced energy intake to create varying levels of an energy deficit (energy deficit or ED groups). 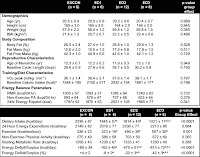 ED groups were defined by an energy prescription comprised from the quantity of calories provided as food and the quantity of calories expended as exercise. ED groups were prescribed targeted reductions in energy intake (7 days/week) compared to their Baseline energy needs ranging from – 15% to – 30% in combination with prescribed increases in exercise energy expenditure (5 days/week) equivalent in calories to + 15% to + 30% of Baseline energy needs. So, how low can you go? The scientists fount that the estimates of the magnitude of energy deficiency associated with menstrual disturbances ranged from -22% (ED2) to -42% (ED3), reflecting an energy deficit of -470 to -810 kcal per day, respectively. In contrast to the what Williams et al. expected, the severity of menstrual disturbances, was not dependent on the magnitude of energy deficiency and is thus not a gauge to estimate how much more you'd have to eat to become fully functional again. 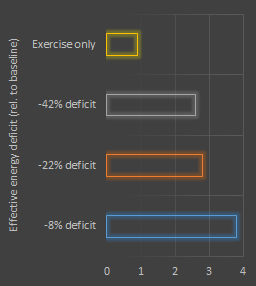 As the researchers point out, specifically, the initial four energy deficit groups were intended to represent 1) an increase of 15% kcals of exercise (15% deficit), 2) an increase of 30% kcals of exercise (30% deficit), 3) a decrease of 15% in dietary intake, combined with an increase of 15% of exercise, (30% deficit) and 4) a decrease of 30% in dietary intake, combined with an increase of 30% kcals of exercise (60% deficit). As you can see in Figure 1 the plan worked out quite well and the original hypothesis that the severity of the energy deficit would correlate with the risk of overall risk of menstural irregularities. What is interesting, though, is that the overall linear increase was visible mostly for the luteal phase disturbances. Actual unovulatory cycles were observed only in groups ED2 & ED3, but - and this is important - for some women, it was enough to just work out to induce oligomenorrhic cycles, i.e. infrequent (or, in occasional usage, very light) menstruation. Next to the menstrual irregularities, which were obviously what the scientists were actually interested in, the scientists also observed that the 34 subjects lost weight, 3.8 kg in the ED1 and - listen up ladies! - only 2.8 kg and 2.6 kg in the high(er) energy deficit groups ED2 and ED3 (no significant weight loss occurred in the exercise only, i.e. the EXCON group). Bottom line: Let me say this right away. It's not unfair, but very clever that nature made sure that starving women cannot become pregnant. If you look at the "target outcome" of most women's dietary interventions, i.e. the amount of weight they lose (see Figure 2), you will also have to concede that what many women believe would be "unfair" actually protects them from ineffective starvation diets. It was after all not the group with the highest, but the group with the lowest energy deficit that lost the most weight. So, ladies, be sure to remember this and if you are still not convinced that starving yourself is not the magical weight loss solution that will give you the "shape cover model" body you're looking for, take another look at the "9 Rules of Sensible & Effective Dieting" | Comment on Facebook. Barrow, Gray W., and Subrata Saha. "Menstrual irregularity and stress fractures in collegiate female distance runners." The American journal of sports medicine 16.3 (1988): 209-216. Bennell, Kim, et al. "Risk factors for stress fractures." Sports Medicine 28.2 (1999): 91-122. Brukner, Peter, and Kim Bennell. "Stress fractures in female athletes." Sports Medicine 24.6 (1997): 419-429. Friday, Karen E., et al. "Elevated plasma low-density lipoprotein and high-density lipoprotein cholesterol levels in amenorrheic athletes: effects of endogenous hormone status and nutrient intake." 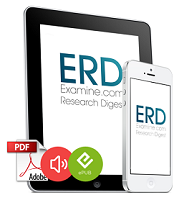 The Journal of Clinical Endocrinology & Metabolism 77.6 (1993): 1605-1609. Hoch, Anne Z., et al. "Athletic amenorrhea and endothelial dysfunction." Wisconsin Medical Journal 106.2 (2007). O’Donnell, Emma, and Mary Jane De Souza. "The Cardiovascular Effects of Chronic Hypoestrogenism in Amenorrhoeic Athletes." Sports Medicine 34.9 (2004): 601-627. Rencken, Monica L., Charles H. Chesnut, and Barbara L. Drinkwater. "Bone density at multiple skeletal sites in amenorrheic athletes." Jama 276.3 (1996): 238-240. Wade, GEORGE N., JILL E. Schneider, and H. Y. Li. "Control of fertility by metabolic cues." American Journal of Physiology-Endocrinology And Metabolism 270.1 (1996): E1-E19. Williams, Nancy I., et al. 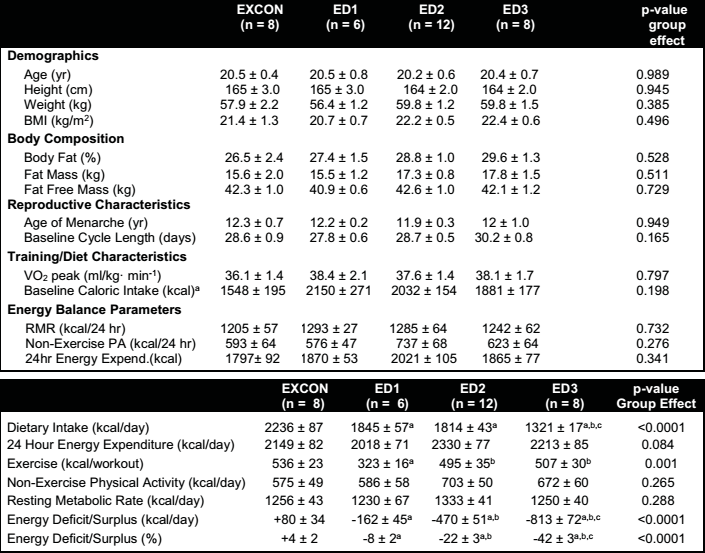 "Magnitude of daily energy deficit predicts frequency but not severity of menstrual disturbances associated with exercise and caloric restriction." American Journal of Physiology-Endocrinology and Metabolism (2014): ajpendo-00386.